Sydney Glover serves as the Partnership Activation Coordinator with the Indianapolis Indians. The goal of this series is to spotlight the people, programs and stories in the baseball industry that champion diversity and inclusion and advance the mission of Minor League Baseball's diversity initiative. In recognition of Women's History Month, every week in March, we will profile a female leader in our industry. This week we profiled the Indianapolis Indians' Partnership Activation Coordinator, Sydney Glover. Sydney Glover began her career in Minor League Baseball with the Indianapolis Indians as an intern in the ticketing department. After less than a year in that role, she was promoted to Partnership Activation Coordinator where she collaborates with internal departments to bring life to the unique partnership deals within the community. Minor League Baseball has a growing cohort of women who are quickly making their presence felt across the industry. Over the years, women in baseball have paved the way for those behind them to feel empowered and confident in their ability to create impact. Their work has allowed women like Glover to flourish. Glover supporting the Children's Museum of Indianapolis at their summer camp baseball clinic. "In this day and age, I think being a woman with a successful career in sports is more attainable than ever. I am surrounded by women who excel at their jobs day in and day out," said Glover. Glover speaks glowingly of the office culture in Indianapolis, where she affectionately refers to her coworkers as her second family. One of the reasons she feels so comfortable and empowered in her organization stems from the fact that the Indians are one of the few MiLB teams who have put together their own internal diversity committee. As the new chair of this committee, she is planning to use her platform to influence the team's overall performance. "Having a dedicated diversity committee has directly fed into our strong office culture. Our work once focused solely on the hiring practices and employee evaluations, but we're now beginning to look at more areas of the business including social media, marketing materials and our digital presence. We've solicited input from leaders in the front office to influence our strategy and create transparency throughout the entire company regarding our goals. We want to be the most successful team in all aspects - ticket sales, attendance, community partnerships, diversity and inclusion and the production of progressive ideas." Glover graduated from Yale University in 2017 where she was an outfielder for the softball team. In the balancing act of advocating for diversity and inclusion, adapting to a new role in the office and pushing through the daily grind of working in Minor League Baseball, Glover has no room for moving passively. The Indianapolis Indians are already a staple in the entertainment culture of the community, and to take the team to the next level, they'll need leaders like Glover to continue being bold and creative. "Anyone working in baseball will tell you that the hours are not for the faint of heart. I can't be timid in my role in the office or on the diversity committee. As the only woman of color and one of the youngest people on the committee, I must be an advocate for diversity in all ways. I can't be shy or afraid to speak up. I want everyone on our committee and in our office to buy into these initiatives 100 percent." Still relatively new to the industry, Glover already has a competitive streak. In 2017, she graduated from Yale University, where she competed on the varsity softball team. With an Ivy League pedigree and a student-athlete mentality, she is confident in herself and looks to challenge sexism and contribute to creating pathways for women into the industry. "I have only been in Minor League Baseball for about a year and a half and have already seen great strides made in terms of female representation. Sadly, though, there are still people who will see you as woman in baseball and not take you seriously or make inappropriate comments. I look forward to the day when women aren't pressured to look more professional or smile more or be more 'on-point' than men just to justify working in sports." A participant in the 2017 MiLB FIELD Program, Glover is now preparing for her second season with the Indianapolis Indians. Glover is an alumna of Minor League Baseball's FIELD (Fostering Inclusion through Education and Leadership Development) Program, which strives to introduce women and racial minorities to careers in Minor League Baseball. It's safe to suggest that her participation in the program has supercharged her ambition to find success in baseball. "Being a part of the FIELD program was such a powerful experience. I've always loved the game of baseball but, prior to FIELD, had a hard time seeing a career for myself in MiLB because I didn't have any connections in the game. The program allowed me to not only connect with many executives and leaders working in Minor League Baseball, but, most impactfully, it connected me with peers from across the country also looking to start their careers in baseball. My FIELD cohort has been such a valuable resource for me to call on, and we still stay in touch to this day. We build each other up, share job opportunities and help one another get through the dog days of summer." 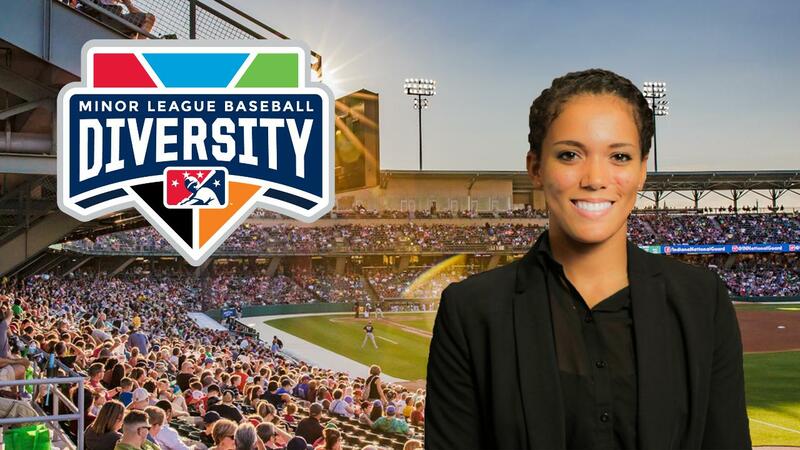 With leaders like Glover successfully tackling some of the industry's issues in her role, Minor League Baseball is bound to continue its upward trajectory in holding true to its goal of being the most fun and inclusive league in sports.